We can’t escape the images of refugees fleeing war and poverty in Syria, Afghanistan, Iraq, Somalia, Libya, Eritrea and the list goes on. 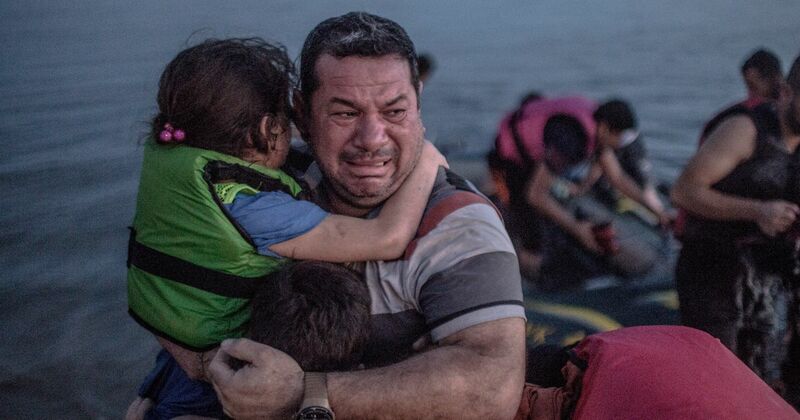 Certain photos have become iconic: A baby boy’s body washed up on a Greek island; an anguished father holding his exhausted child. Some nations like Hungary have placed razor wire, others like France and Germany struggle to make room for hundreds of thousands of the displaced. Then last week a terrorist cell brought carnage to Paris. 128 murdered/ executed, 350 plus wounded, a city and nation traumatized. One assailant was believed to be a Syrian. The response of many around the world was fear. Fear that the tide of refugees contain terrorists. Fear that we need to put up barriers between ourselves and those who are different. Fear that we too are at risk. In the United States Donald Trump has climbed to the top of Republican presidential poll waving the flag of fear. He’s called for an insurmountable wall being built along the Mexican border. He’s called for mass deportation of 11 million undocumented immigrants, most from Mexico. Speaker of the House Paul Ryan in the wake of the Paris attack has called for a halt to efforts to welcome Syrian refugees. He’s called the current 18 month vetting process insufficient. Nearly all Republicans and a significant number of Democrats voted with the Speaker. Over half the Governors support further restrictions. Fear has a way of constricting the mind and the heart. Many who have voted to remove the welcome mat are people of faith. What are we to make of this? Jesus understood the power of fear. He understood what it means to be a homeless refuge. In response he told a story whose hero is a Samaritan, an outcast. At a time when an emphasis was placed on religious orthodoxy and racial purity the Samaritan was neither. They were outcasts. Looked down upon by those in power. In his story in Luke’s Gospel 10: 25 – 37 Jesus tells of a man beaten, robbed, stripped naked and left to die in a ditch. Along comes a religious leader who sees but chooses to walk by. Next is a political leader who also walks by. It is one thing to say or do the right thing when there is little cost. But as we wrestle with how to respond to the refugee crisis this isn’t easy or cost-free. My faith tradition puts it this way, ‘this is come to Jesus time’. We either believe in Jesus’ wisdom or we don’t. We either believe in the power of love or we give in to the power of fear. This is the time when we as Jesus followers are called to push back against the fear peddlers. We are called to set aside our fears and step out in faith. We are asked to place our faith in a 2000 year old story that promises to show us the way forward. Will you walk with me? Thanks. We’ve got a lot of work to do to open up hearts and minds! You hit the nail on the head with this. It is a conundrum and we as Christians are called to serve. While I’m usually very wary of applying Jesus’ teachings (intended to guide and ennoble individual believers) to the political State, this parable is interesting in light of the current refugee situation. 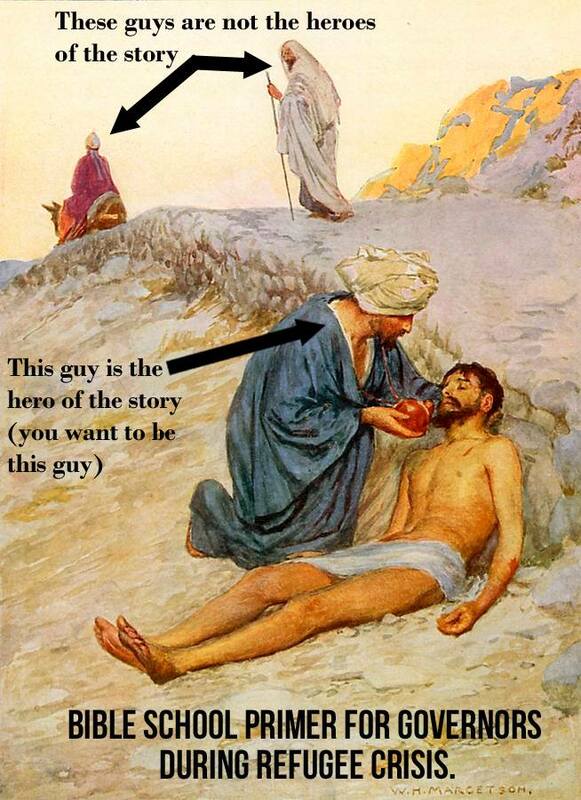 Interestingly, the Good Samaritan puts the victim up in an inn and pays for his stay. He doesn’t bring him to his house. Would the parallel of this be, perhaps, to fund a hospitable safe zone in Syria or one of her neighbors? Or perhaps one could fund Assad, the legitimate ruler of Syria and proverbial innkeeper, so that he could get back to managing state affairs and keeping order within his state. Another response could be to stop funding those militant extremists who are destabilizing the region (e.g. Netanyahu’s administration and anti-Assad rebels). In this case, we would have to stop paying federal taxes. I don’t suppose refusing to support war-mongers with our tax dollars would be “easy or cost-free,” but if we are to get at the root of this crisis, we must stop supporting those who are destroying the nations the Middle East. Finally, we as the people of earth devoted to peace, must start organizing a governmental structure through which the nations can settle conflicts without going to war. I see a supernational government of, for, and by the people of Earth as a most needed response to the shadow government that now rules the nations by controlling their currencies. We must be wise as serpents and harmless as doves. We must beware of wolves in sheep’s clothing, and we the peacemakers must be more active and organized than the warmongers. For the advancement of civilization! I think you are right on that the root causes of violence needs to be understood. It’s interesting that ISIS didn’t come about by accident. Saudi Arabia has been funding fundamentalist schools throughout the middle east for decades. Funded by the $ we pay for their oil. These schools created the intolerant Taliban and by extension ISIS. The war in Iraq further destabilized the region resulting in factors destabilizing Syria. For me the question is how do we advocate for respect for all people, Muslim and minority groups such as Christians in that part of the world. Not an easy task but one I pray we are up to.